Game 1 of the Toronto Maple Leafs-Boston Bruins series is tonight with fans from both sides waiting for puck drop with bated breath. Last season’s Game 7 loss is still fresh in everybody’s mind. 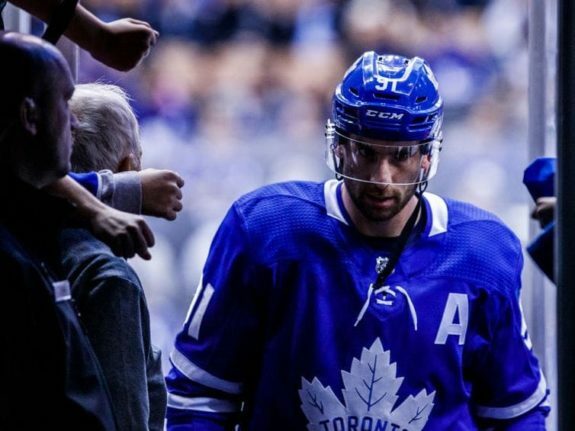 Toronto hopes that the acquisitions of John Tavares and Jake Muzzin will be enough to tip the scales in their favour this time around. But it is still hard to shake that uneasy feeling that comes when facing the Bruins. The Maple Leafs have played the Bruins four times this season and won only one of them. Before round one kicks off for Toronto, why don’t we take a look back to see if we can learn anything ahead of tonight’s Game 1 tilt. The underlying numbers suggest that this game wasn’t nearly the debacle that the score would suggest. Toronto outshot Boston 41-34 while sustaining consistent pressure and puck possession. The Maple Leafs led in total Shot Attempts 64-57 with 55.2 percent of their Zone Starts coming in the offensive zone (per HockeyReference). So what went so wrong? Some would point to Garrett Sparks, who was manning the crease that night in the midst of his poor first full season in the NHL. While it may be easy to pile on the blame for Sparks this season, the loss was out of his hands. While Toronto out-chanced the Bruins, Boston’s first four goals (three at the hands of a red-hot David Pastrnak) were a result of Toronto’s mental lapses in their own end leading in point blank chances. This has been a troubling trend for Toronto in the Mike Babcock era. Even when the Maple Leafs are driving play and out-chancing the opponent, the leaky blue line is prone to levelling the playing field with deflating giveaways and blown defensive coverages. This is a trend that Toronto will have to learn to buck if they hope to make a deep run in the playoffs. This was a huge home win to bring the Maple Leafs to a 17-8-0 record on the season. Unlike their first encounter, Boston heavily out-chanced Toronto this go round and it was up to Frederik Andersen to steal a win for the blue and white. He had to make 38 saves while keeping his head on a constant swivel as Boston piled on 89 shot attempts to Toronto’s 64. In a season where Maple Leafs fans have been treated to stellar play from the like of Auston Matthews, Tavares and Morgan Reilly, it has been Marner who has been Toronto’s MVP. 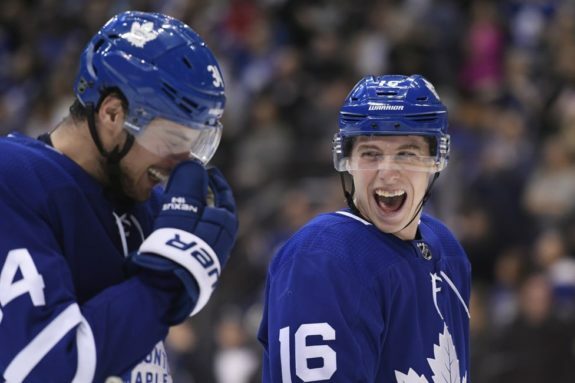 This season, Marner led the team with 94 points and 68 assists while playing on the top line with Tavares and Zach Hyman. Marner led all forwards in ice-time with 19:49 per game while getting valuable minutes on both the power play and penalty kill. Matthews and Tavares will get a lot of the attention heading into the playoffs, but I would argue that Marner will be Toronto’s most important forward of the bunch. This was one of the most deflating losses of the season. It was Boston’s first look at a healthy Maple Leafs team with both Matthews and William Nylander, but the Bruins rose to the occasion. They chased Andersen out of the crease with six goals on 28 shots. While I have said that the Maple Leafs can’t expect to go very far without Andersen’s “A” game,( they certainly can’t win when Andersen isn’t making the routine stops. Jaroslav Halak’s .906 save percentage that night wasn’t anything special, but he made the timely saves and kept Toronto to one goal until the 12:22 mark in the third. At that point it was far too late for the Maple Leafs. As good as Andersen has been in the past, the Bruins might have the overall edge in net. Tuuka Rask is a fantastic goalie in his own right and Halak is one of the best back-up’s in the game. Just as this Dec. 8 game illustrated, Boston can confidently turn to either goalie which just isn’t a luxury that Toronto possesses. Of their four meetings, this was the best game that Toronto played. The result was not what they were looking for, but it was one of Toronto’s most complete games of the season. They controlled play with a 57.0 percent Corsi For Percentage while matching Boston’s physicality with 28 hits to the Bruins’ 29. Had it been Andersen in net instead of Michael Hutchinson, maybe Toronto comes away with the win. This game in January was the last time Toronto saw Boston this season. Since this final regular season matchup, the only major change to Toronto’s roster was the trade for Muzzin. Otherwise the Bruins have a good idea of who they will be facing in round one. At the end of the day this should be another great series between the Maple Leafs and Bruins. Boston had the third-best record in the entire NHL and Toronto wasn’t far behind at number seven. For Toronto to beat Boston they will need a complete 60-minute effort on a nightly basis. As we’ve seen in the recent past, Boston is a team that will pounce on mistakes and one mental lapse from Toronto could cost them the series. The Maple Leafs have shown in flashes that they have the talent to be among the game’s elite. But for them to finally conquer their demons and beat Boston, Toronto will have to put it all together on the hockey world’s biggest stage. Welcome to the 2019 NHL Playoffs.